I love to read. I've loved to read as long as I can remember. 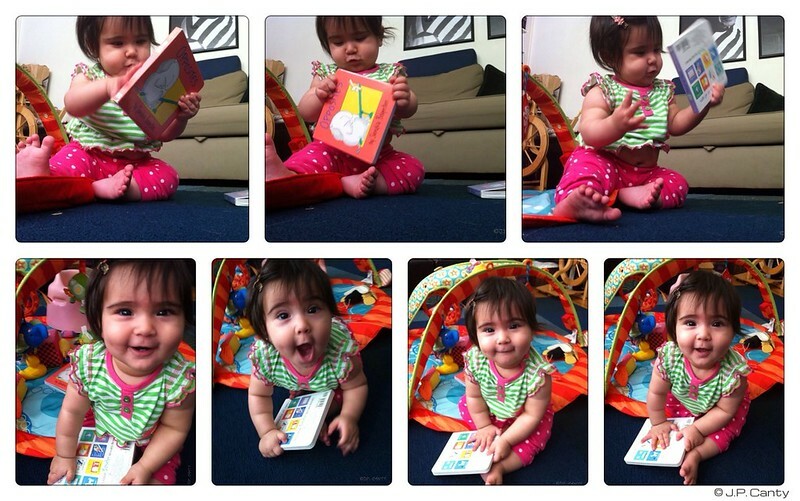 When I was pregnant, before we bought clothes or furniture for Genevieve, we bought her books. At the baby shower, she was given a whole pile of board books. I used to think that board books were clumsy and stupid. Now that Genevieve is in full sensory exploration mode all the time, and wants to be involved with the whole process, I think they are completely brilliant. I hope she'll love to read, because she comes from a long line of readers. This reminds me of a dozen years ago, when I was doing a two-week long babysitting stint. The younger daughter, Sarah, was in kindergarten and had been sent home with a sight-word reading assignment. I had done sight-word work before, and I was really looking forward to reading with her. After a few rough starts, Sarah got frustrated, dramatically flung herself across the couch, and declared, "I'll NEVER learn to read!" A better person may have done... well, something other than laugh hysterically. Once I managed to regain some of my composure, I pointed out that it would be IMPOSSIBLE for her NOT to learn to read. After all, both her parents and sisters LOVED to read. Appealing to her six-year-old logic worked, and I'm pleased to say that Sarah is now a high school senior. A high school senior who loves to read. I have a high school senior who loves to read....and in preschool INSISTED she needed "Hooked on Phonics " because school was taking too long! Do you have the most photogenic child ever or what? What a cutie! Oh yes....board books are the best!!! We are still using them often at almost 2 years old. Carmen loves books and we read at least 3 every night before bed. We started that tradition early. We read throughout the day too. G is SO cute!!! Love her reading self! My 4 kids loved their board books - and the youngest especially loved the Sandra Boynton books, as did I!! Board books are *fabulous*. They help kids with what experts call "pre-literacy skills" like "print awareness"and "print motivation", which are fancy ways of talking about knowing what one does with a book, that one reads from left to right and top to bottom, etc. For tiny tots just developing their motor skills, those chunky pages are perfect! Once again: the cutest pictures of Genevieve! Our almost-2 year old grandson loves to read too...and we love the board books as well! We took him on his first train ride today - and then bought him a board book about trains. Are your collages simply through Flickr? I can't figure out how to make them! Do you have the Helen Oxenbury board books? They are fun to read, the illustrations are great, and babies love them. So do I.
Oooh, the Sandra Boynton books are well-loved in the bookshop I work in. And that's just by the booksellers, we're a bit obsessed with having a personal penguin! When she's a bit older, Oliver Jeffers is a wonderful, wonderful illustrator and children's author. His books are well worth a look. She's such a beautiful little girl. Al pretty girls love to read. LOVE Sandra Boynton books - and so does my two-year old daughter. :) She now looks at the back cover and picks out the ones she doesn't have (yet) and says, "I'm missing this one, and this one, and this one..." Apparently the book collecting gene got passed along. Make sure you get a copy of Pajama Time!